4 Bedroom Detached House For Sale in Plymouth for £380,000. Plymstock offers a range of local amenities from supermarkets and cafes, to banks and schooling for all ages. There are regular bus services into and out of Plymouth city centre and it's well positioned for those who enjoy coastal walks. A detached four to five bedroom family home set within the prestigious development of Raleigh Woods. 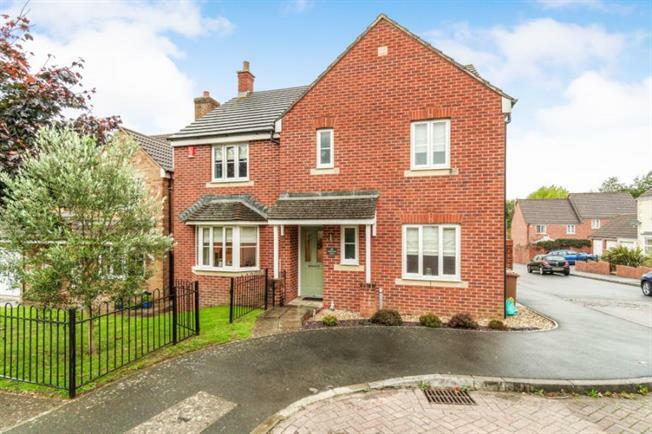 Offering spacious reception areas comprised lounge, separate dining room, study/bedroom five, kitchen-breakfast room, utility room and downstairs wc on the ground floor. The master bedroom enjoys an en-suite shower room with wc and a walk in wardrobe. The remaining three bedrooms benefit from a family bathroom. The garden enjoys a south west facing garden and leads to a double garage and large driveway concealed behind wooden gates. The property benefits from gas central heating and upvc double glazing. Door into entrance hallway. Door leading to W/C, Lounge, Kitchen and Study/bedroom Five. Stairs leading to first floor. Radiator. Under stairs storage cupboard. Upvc double glazed window to the front. Low level W/C, wash hand Basin with taps over. Radiator. Upvc Double glazed bay window to the front aspect overlooking the front laid to lawn garden. Inset feature electric fire with wooden fire surround. Ceiling light, carpeted flooring and radiator. Double glazed doors into the dining room. Upvc Double glazed sliding patio door leading out on the patio alfresco dining area. Door leading to the kitchen. Laminated flooring, radiator and ceiling light. Upvc double glazing window to the rear aspect overlooking the garden. Upvc double glazed sliding door leading on to the patio area where alfresco dining can be enjoyed. Door leading to the utility room. A range of contemporary wall and base units complimented by role edge worktops. Inset gas hob with hood over. Built in double oven, integrated dishwash and stainless steal sink with mixer tap over. Ceiling spotlight, tiled splash back areas, radiator and laminated flooring. Upvc double glazed door to the side. leading to the front and rear garden. A range of wall and bas units complemented by role edge worktops. Space for Washing machine and dishwasher. Stainless steel sink with mixer tap over. Laminated flooring and ceiling spotlights. Upvc double glazed window the front aspect. Radiator, carpeted flooring and cieling light. "u" shape landing. Doors leading to four bedrooms and a family bathroom. Storage cupboard. Loft hatch. Upvc double glazed window to the front aspect. Doors to en suite shower room and dressing room. Radiator, carpeted flooring and ceiling light. Upvc double glazed window to the front aspect. Fully fitted wardrobes. Carpeted flooring, raditor and ceiling light. Upvc double glazed obscure window to the side. Low level W/C, wash hand basin with taps over. Walk in shower with sliding doors. Thermostatic mixer shower over. Tiled, carpeted flooring and ceiling light. Upvc double glazed window to the rear aspect. Built in wardrobe. Radiator, ceiling light and carpeted flooring. Upvc obscure double glazed window the rear. Low level W/C. Vanity unit with wash hand basin. Mixer tap over. Bath with mixer shower and glass shower screen. Tiled splash back areas, carpeted flooring, radiator and ceiling lights. Upvc double glazed window to the rear. Carpeted flooring, radiator and ceiling light. Upvc double glazed window to the front aspect. Built in three door wardrobe. Carpeted flooring, radiator and ceiling light. To the front of the property there is an enclosed laid to lawn lined by shrubs and tree's. Double wooden gates lead onto the rear driveway parking, double garage and a tiered landscaped garden. The gardens enjoys a south west facing aspect and benefits from sunshine for the best part of the day. Raised beds and patio alfresco dining area. Well established shrubs and trees. Steps from the driveway lead to side access and rear access. Exterior electrical power point and water tap. Double garage with electric up and over door. Upvc double glazed door to the side. Power and lighting. Part boarded roof storage space.